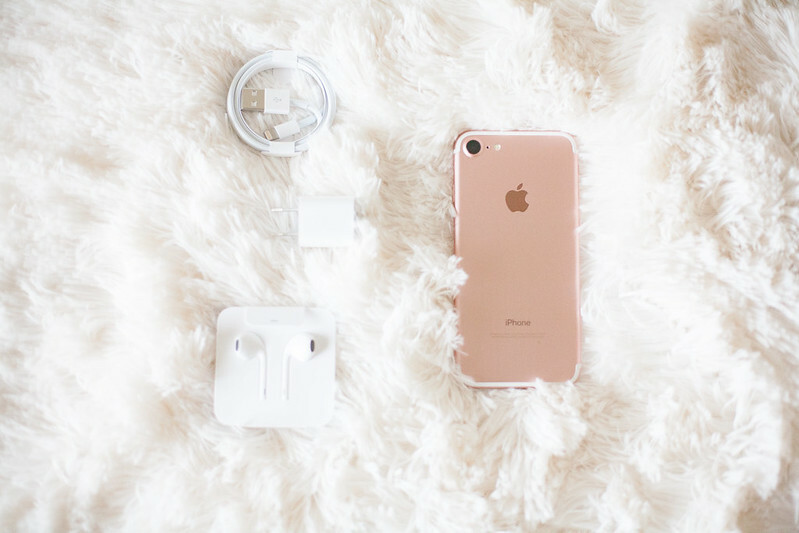 by gillian claire: iPhone 6 vs. iPhone 7 review + unboxing! Oh hey, I finally got a new phone! I've been using my iPhone 6 with a completely shattered screen for a long time now so it was about time to upgrade. ( Shattered phone not pictured: sorry that you don't get to see that hot mess! ) I thought I'd do a little unboxing and comparison post for those of you who are maybe considering upgrading soon as well! Of course, I picked the rose gold. I have to say now I have my hands on it though that this color is a little more "rose" than rose gold to me. I would probably just call this color metallic pink instead but it's very pretty regardless. Shown above is all of what came in the box: phone, new charger and a new set of headphones; always appreciated because I lose these things like mad. One new feature of the iPhone 7 is that it no longer has the headphone jack. I guess Apple is assuming that wireless headphones are the way of the future. I've also read that they did away with the headphone jack in order to make the phone water resistant. I wasn't sure how I felt about this feature but the iPhone did come with a pair of headphones that fit into the charging jack which is genius. 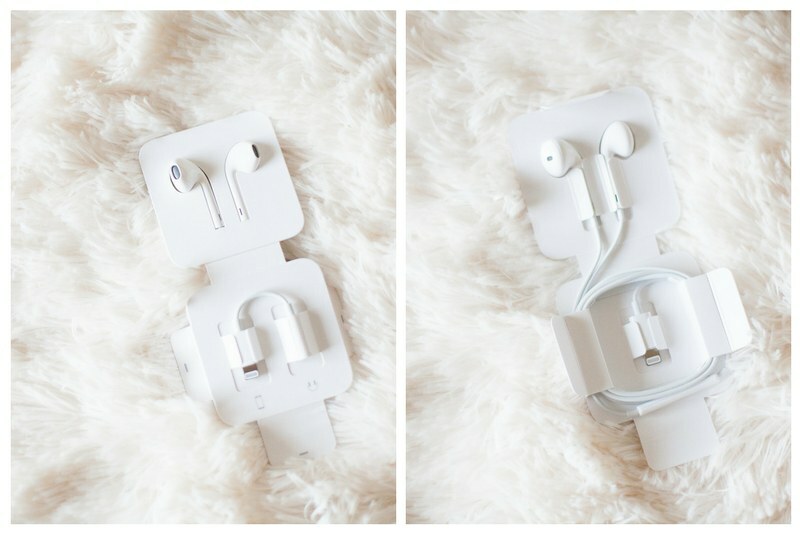 It also comes with an adapter that you can use to make a regular pair of headphones work in the charging jack. The only problem is that you can't charge the phone while using these headphones. This is sometimes a pain for me on the treadmill at the gym but wireless headphones would definitely solve that problem. The iPhone 7's rear camera is a lot bigger (and better) than the camera on the iPhone 6 which was a huge pull for me in getting this phone. The biggest pull was that this phone made my plan cheaper since Sprint was having a special offer, ha! The main reason that I even care about having a smartphone is for the camera. I love using my iPhone camera and I'm obsessed with Instagram so it was definitely time for me to upgrade. If you want the highest quality iPhone camera out there, go for the iPhone 7 Plus which has the portrait mode feature. I honestly didn't realize that the iPhone 7 didn't have portrait mode but I'm still happy with this upgrade for now. 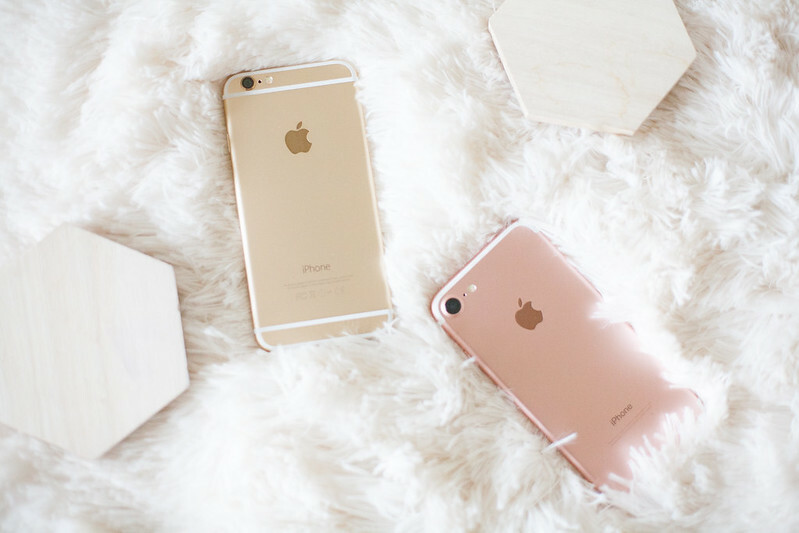 So now it's time for a little comparison between the iPhone 6 (shown here in gold) and the iPhone 7! 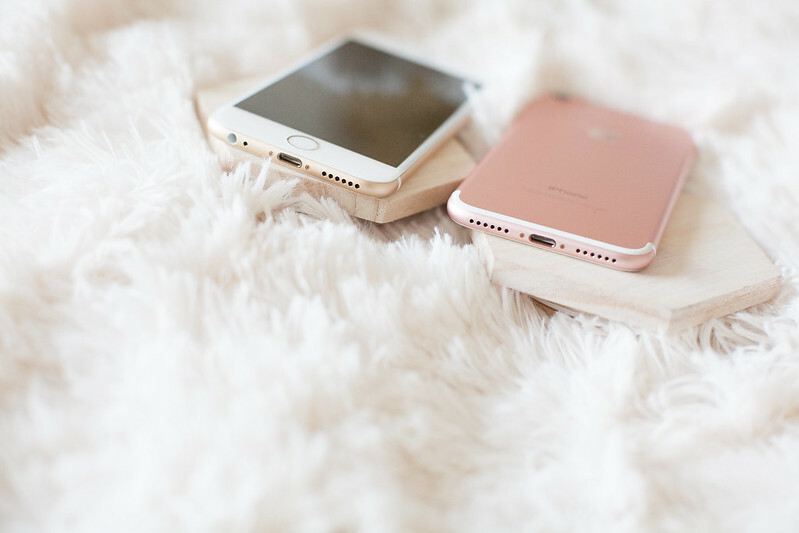 I never did get the iPhone 6s and I know that the jump from the iPhone 6s to the 7 isn't as drastic but there are quite a few differences between the 6 and 7 and even significant changes from the 6s to the 7. 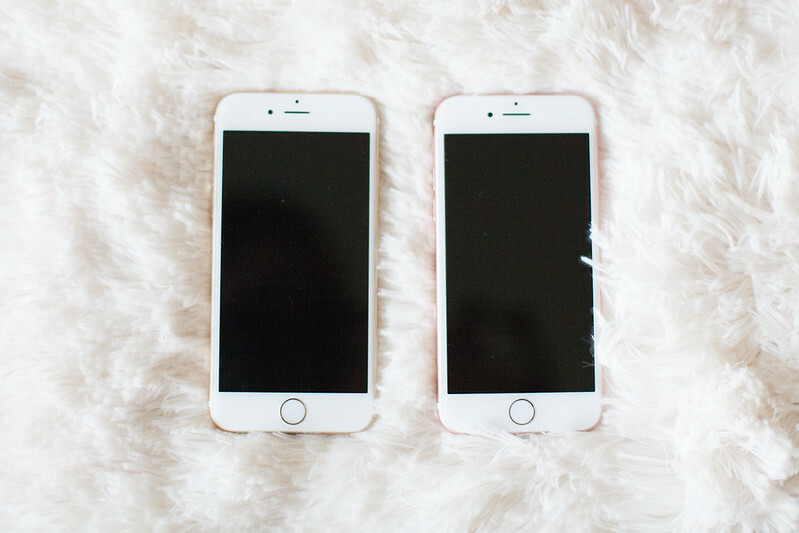 As you can see, the phones are practically the same exact size and look almost identical. From the back of the phone you can see that the biggest differences are the camera size as well as the fact that the iPhone 7 did away with the visible antenna lines. The front of these phones look exactly the same but there is a huge difference in the home button. With the iPhone 7 they did away entirely with the moveable, clickable home button and the home button is now completely touch activated. It's kind of freaky because the button still feels "clickable" using vibrations. This blows my mind a little bit. Taking away the moveable parts makes the iPhone 7 a little sturdier; I know this firsthand because on my previous iPhone 6, I lost the home button entirely and was using assistive touch for a couple months. Above, you can see the changes that the iPhone 7 made to the bottom of the phone by removing the headphone jack and replacing it with dual speakers. The dual speakers are supposed to add to the audio of the iPhone 7, which is a nice thought but I haven't noticed a huge difference. The iPhone 7 uses the same size charger as the iPhone 6 which is awesome because now for once I actually have two working chargers laying around my house! 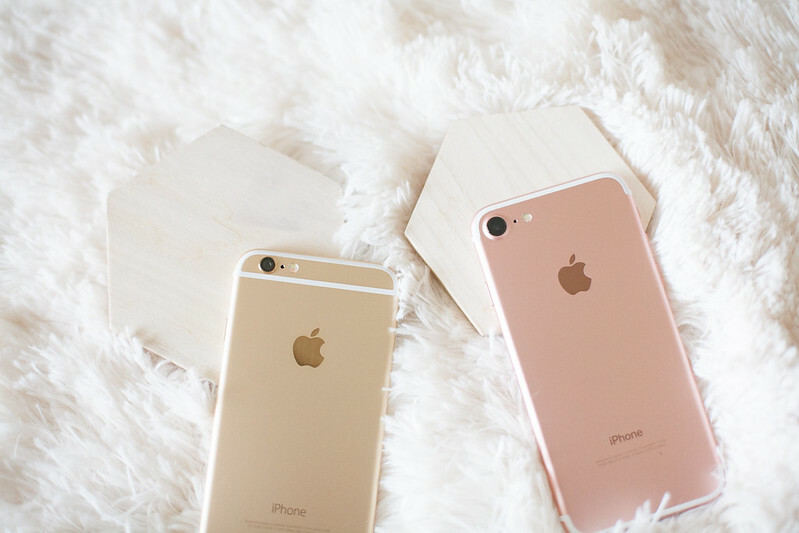 There's my run down on the new iPhone 7. Overall I don't have any complaints! 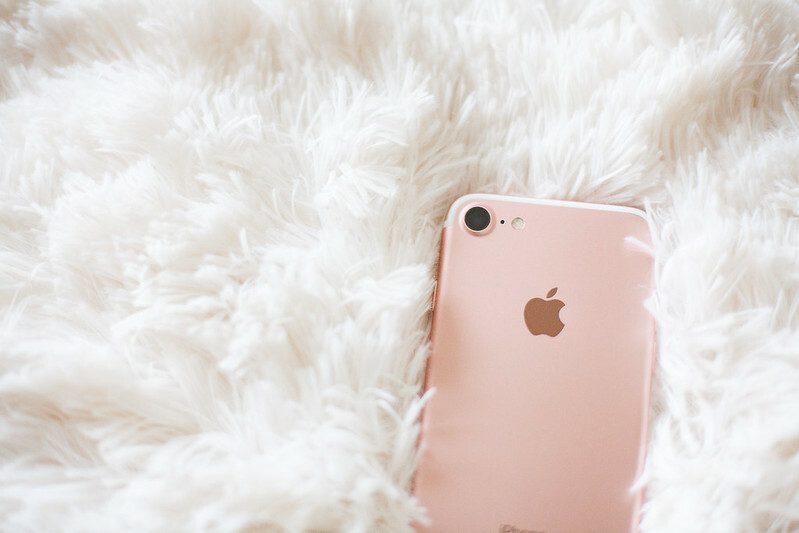 Have you guys upgraded to the iPhone 7 or 7 Plus yet? I'd love to hear your thoughts below! Great to see! I'm one of those people who NEVER upgrades until I have to, because I hate learning new technology, lol. The & looks great though and doesn't seem too be too different, which is good for people like me! Oh my gosh, I totally feel you on the not wanting to learn new technology thing! Luckily this phone operates basically exactly the same. I feel so old school sometimes when I get angry about technology, hah! Thanks for doing this review. I just watched a commercial yesterday that sucked me in because of the portrait mode, and the slight bokeh it gives the photos. Of course my husband looked at me like I was crazy. Hehe!! Enjoy your new phone!! Thanks for stopping by, girl! The iPhone 7 Plus is the one that has the portrait mode and I've been sucked in by seeing that as well. It's crazy how advanced these little phone cameras have become! I have an iPhone 6 and my husband just upgraded to the iPhone 7. So far, I don't see a big need to upgrade besides maybe some camera features but still! 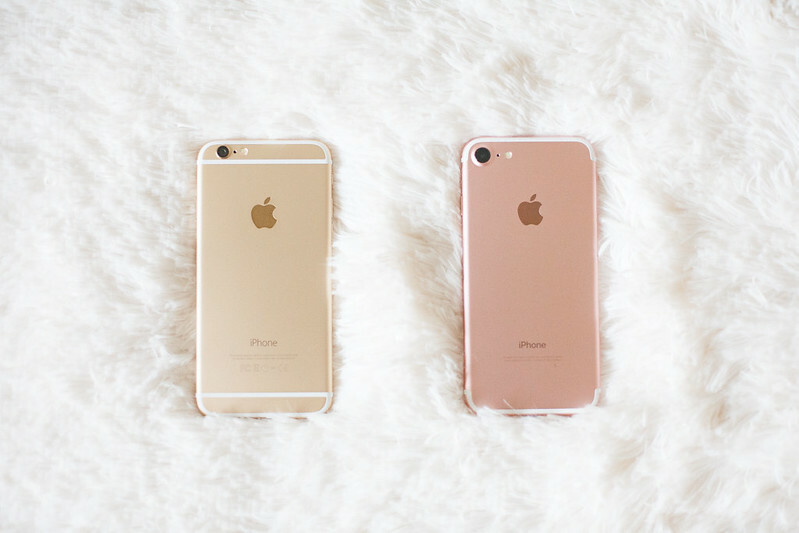 I love my iPhone 6! I agree that the iPhone 6 is a great phone! I hear that the iPhone 8 is going to have some more advanced features vs the iPhone 7. I want the 7 just for the better camera! I'm one of the few out there that goes for android over iPhone. The iPhone does look pretty. I've heard that android phones are more advanced over the iPhone. I just fall for that apple label every time! Yes!!! I upgraded from the 6 to the 7plus. That was a pretty drastic change! I am loving the camera and the portrait mode. It really amazes me how good of a picture it takes! I'm in the exact same situation with my 6...my daughter shattered the screen when it was like 3 months old and I've had it cracked ever since! 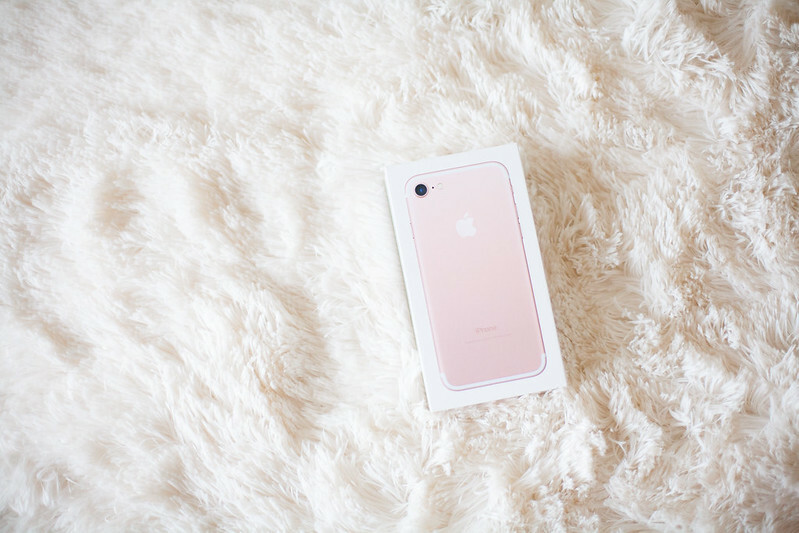 I can't wait to upgrade this summer and I've been planning on a rose gold 7+! I'm so torn on whether or not I should have gone with the 7+! I've heard the camera on the new phones are amazing. I wish I "needed" to upgrade because that's reason enough for me to. Great comparison! I have been wondering if I should upgrade (I have the 6+) and the front camera along is worth the upgrade well and now the front facing camera also has a flash now.